No matter how good you or your vocalist can sing, your vocal track will sound pretty bad if you’re not using a good microphone. With so many vocalists out there that think that just showing up with a bottle of water and no microphone to rehearsals and recording sessions, it’s no wonder that auto-tune and heavy editing can be heard on so many songs. Never let your talent go to waste by using just any microphone you happen to find in the studio. A good microphone is as important to a music producer as a good amp or guitar is to a guitarist. Don’t know where to start and what to look for? No worries. You’ve come to the right place. Rode is a brand name that first comes to mind of most musicians and studio engineers, and for a good reason. 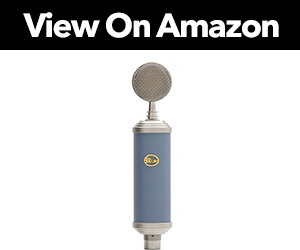 Their NTK condenser microphone offers amazing audio quality and all of the pros of an old school valve mic. Due to the nature and feeling of valve tube microphones, the NTK yields the best results when used for recording pianos, acoustic guitars and mellow vocals. The recordings sound very natural and warm, with loads of details. That being said, don’t think that it can’t be used for other purposes as well. It’s rated for an SPL of 158dB, with no buzzing or sound degradation even alongside a heavily distorted guitar or louder vocals. What really sets this model apart from the others, is the fact that it’s amazingly quiet. With less than 12dBA self-noise, you can barely hear it when it’s on. 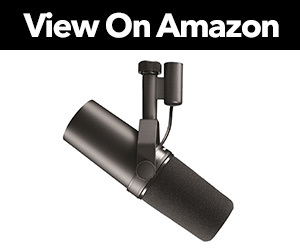 Perfect for capturing all the subtle details and vocal dynamics. All things considered, the NTK by Rode offers a very unique and old-school recording experience. The recording quality is, without a question, exceptional. 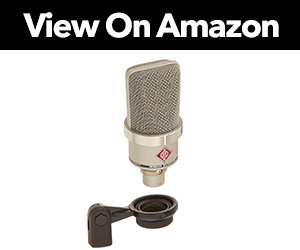 If you like the warm touch of tube mics, definitely consider getting this one. At number 2, we have the AT2035 from Audio-Technica, a high-quality microphone that’s suitable for much more than just recording vocals. Though this is a condenser microphone, it’s more than capable of handling louder audio sources, with amazing sound pressure level specs. For around $150, you get much more than you would with most other models in this price range. It’s bulky, and pretty solid due to the metal build. The included shock mount and the switchable high pass filter make sure that no rumbles or unwanted low-end noises are noticed in the recordings. No matter the style of vocals you end up recording, the AT2035 lives to the expectations. While the frequency response is relatively flat and provides a very natural audio image of the audio that’s recorded, there’s a slight hint of warmth, giving it a very crisp and clear performance. If you’re on a relatively tight budget and need a sturdy and reliable recording microphone, the AT2035 may just be for you. While the TLM 102 is the most expensive studio microphone on our list, it’s one of the more affordable models coming from Neumann. So, is spending just under $1000 for a professional microphone a good idea? As you’d probably expect, the overall performance is levels above the other, less expensive microphones on this list. The SPL of the TLM 102 is very high, so you can really push it, as well as the vocals you’re recording to their absolute limits. The recordings are as clean as they can get, rich with all the discreet details you’d expect to get from a condenser microphone. When you compare the TLM 102 with the Rode NTK, as it’s only fair considering the price, the slight boost in the highs is pretty noticeable, as this model offers this feature to help the vocals stand out in the mix. Looking for the best recording mic for under $1000? Look no further than the TLM 102. While Blue is sometimes regarded as a company that focuses more on recording circumstances such as streaming or podcasts, their Bluebird model is without a doubt one of the best microphones for recording vocals for other purposes as well. The vintage design this microphone boasts definitely makes it stand out from the rest of the crowd. Though it looks old school, the technology it utilizes is far from outdated. The Bluebird is a condenser microphone that’s rocking a Class A amplifier that gives it a pretty wide frequency range. The cardioid polar pattern makes sure that any unwanted noises get filtered out, while the audio source gets picked up loud and clear. As the price may suggest, it’s somewhere in between the previously mentioned AT2035 and NTK/TLM-102. Unlike most other condenser microphones in this price range, the Bluebird offers a solid dynamic range, so any vocals from soft bluesy ones, to aggressive, metal growls will sound natural and crisp. When it comes to mid-tier home studio microphone options, the Bluebird definitely offers a unique and high-quality experience. Who says you can’t get a good recording microphone on a tight budget? The 770 from MXL is probably the best condenser mic under $100. 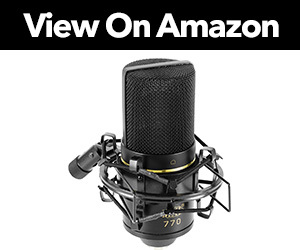 Not only is the 770 one of the cheapest microphones on our list, but the sheer value you get from it is simply amazing. This model utilizes low noise FET preamps meaning it’s very silent on its own. What really sets it apart from other models is the low-end performance. The bass is very well balanced and provides a punch while remaining clear and snappy. While the SPL specs are pretty high, there is still a handy -10dB attenuation pad that may come in handy on certain occasions, making the 770 amazingly versatile. So, who is this microphone for? Though it is very versatile, rapping or guttural vocals seem to benefit the most from the specs and features of the 770. That’s not to say that the highs and mids don’t sound great as well! The MXL 770 is, without a doubt, the best cheap studio microphone that satisfies the needs of most audio engineers and vocalists! At number 6, we have yet another model coming from Rode. The NT1A is considered as the best recording microphone in the under $250 price range by many musicians and sound engineers, and here’s exactly why. While the lows aren’t neglected by any means, it’s the mids and highs where the NT1A truly excels. 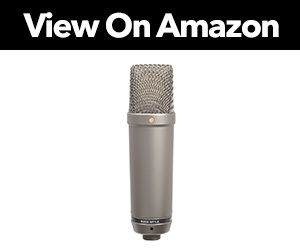 This makes this model a perfect choice for anyone looking for the best vocal mic for female vocals, or any other kind that focuses on these parts of the frequency range. When compared to other condenser microphones with a large diaphragm, the NT1A is incredibly silent, making enough room for all the faint details and dynamics to easily shine through the mix. 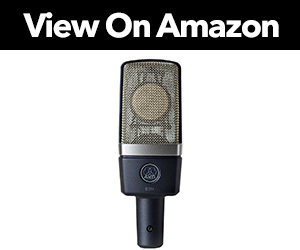 Due to the well-combined specs and features, this model can easily be used for instruments as well, making it a smart investment for anyone looking for a high-quality, yet inexpensive microphone for their studio. While there are definitely better microphones than the NT1A, the overall performance and level of quality you get with it, and at such an affordable price point, makes it worth every cent. No microphone review would be complete without mentioning at least one model coming from AKG. Their Pro Audio C214 cardioid condenser microphone is one of the best vocal mic options when it comes to the mid-range (in terms of price). If you’re looking for the go-to microphone for recording heavy, or simply loud vocals, the C214 is the way to go. You’re looking at 156dB of SPL, and a 20dB attenuator and bass cut filter, meaning you can easily get close and personal with it, without any distortion or signal degradation. Sure, it can handle the volume, but no details are sacrificed, as the C214 performs at amazingly low noise levels while delivering a very high headroom. The body itself is shock and scratch resistant, as well as RF-shielded, so you can easily use it wherever and whenever you want, without having to worry about it getting damaged. Sturdy, longlasting, yet clear and balanced is how you’d describe the C214. 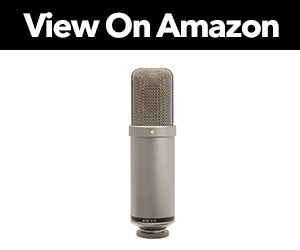 Definitely, one of the best microphones on the market that’s worth considering. If you’re looking for a straightforward, plug and play solution with no hassle, the C-1U from Behringer may just be what you need! It’s the fact that this is a USB microphone that makes it so easy to use. You don’t need any kind of audio interface, just pop the provided USB cable into your PC and you’re good to go. While the C1-U doesn’t have as broad of a frequency range as most other models in this review, it’s still pretty decent for recording vocals and other, similar circumstances. The microphone itself is pretty well built, but the included stand mount is plastic and honestly feels kind of cheap. Though this model also utilizes a cardioid polar pattern, the noise filtering from the sides and behind could definitely be better. With a relatively flat frequency response, you’ll get a pretty natural sounding recording at the end of the day. 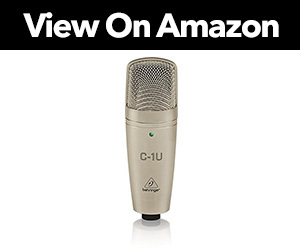 All things considered, the C1-U by Behringer is a great option for anyone looking for an inexpensive, entry-level recording mic that doesn’t require any additional gear. There is hardly a microphone that’s more famous than Shure’s SM58. 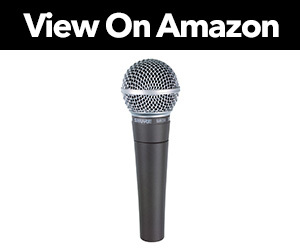 Sure, it may be cheap when compared to most other models we’ve mentioned so far, but the quality and performance you get from it is at the level of more expensive microphones on the market. The SM58 is a dynamic mic, and it can handle very high volume levels without any signal degradation. The body is very durable and tough, as it’s meant for both studio and stage use. As the design is more focused towards on-stage use, it might be a bit more tricky to use with shock mounts, but it’s a great addition to any studio nonetheless. With a frequency response of 50 to 15 000 Hz, the specs could definitely be a bit better, but having the around $100 price tag, you can’t really ask for much more. Reliability, durability, affordability, and a very solid performance are what the Shure SM58 is all about. And finally, at number 10, we have the SM7B by Shure. This is one of the best dynamic mics for vocals, especially considering what you get for around $300. Though the SM7B is widely used in radio stations and for voiceovers, its place in music recording studios is fairly justified. Sure, this is a dynamic microphone, and many sound engineers will argue that for the best sounding recording, you must use a condenser one, but the SM7B often proves those people wrong. The whole frequency range is pretty flat, leaving a ton of room for any adjustments in the mixing/producing phase. The lows, however, definitely stand out, as they are much more rich, yet natural sounding. It’s the highs where this microphone truly shines. They are crisp, transparent, and amazingly smooth, which you can really tell when you record female vocals. Sure, some detail definitely gets left behind, as it is a dynamic mic, but the rest of the specs and features, as well as the end result, make going this microphone a solid choice and smart investment. If you can spare just under $500 for a studio mic, and prefer going for a dynamic one rather than a condenser, definitely consider the SM7B by Shure. Specs and features – What to look for? In order to truly get the most out of your new mic, you first need to understand what certain specs and features give you in terms of usability, performance, and overall quality. While a vast majority of microphones utilize a standard connection type called XLR, there are alternatives as well. USB microphones are becoming increasingly popular due to the fact that you can use them without the need of an additional device such as an audio interface. 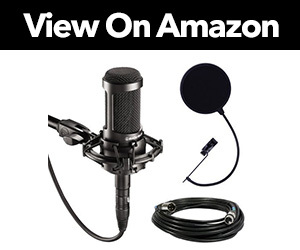 However, we will focus mostly on XLR microphones as most people still use some kind of audio interface for recording, whether it’s recording vocals for musical purposes or even podcasts or streaming. There are basically 2 main types of microphones you can choose from, dynamic and condenser. Dynamic microphones are what you’ve most probably already come across. As the name suggests, these microphones are used for recording a wider spectrum of sounds, primarily in terms of how loud the source is. While noise rejection is at a higher level, and louder sources sound more clear, dynamic microphones don’t capture as much sonic detail as condenser ones. Condenser microphones, on the other hand, might not be as convenient and versatile as dynamic ones, but the clarity and overall resolution they provide is more than just noticeable. Because these two types cater to different needs, we will include models from both categories in the reviews part of this article, so you can get a better picture of both worlds. The frequency response of a microphone tells you exactly how it handles certain parts of the frequency range. Some parts of the spectrum are more emphasized than others, resulting in slight coloration, or, for example, the lows popping out more than the mids/highs. You get a general idea. While many musicians and sound engineers prefer a neutral, or flat, frequency response, some coloration in certain parts of the frequency range can sound good and come in handy in certain circumstances. You can imagine a polar pattern of a microphone as the shape in which the microphone picks up sound relative to the position of the mic itself. A cardioid pattern means that it’s shaped like a heart, capturing the sound in front of the microphone, while rejecting any sound coming from the rear. This pattern is the most commonly used when it comes to recording vocals. Other patterns may suit your needs better, and there are even microphones that feature multiple polar patterns that you can toggle through. SPL tells you the maximum volume your mic can handle and still provide you with a clean signal without any degradation in the audio quality. Unless you plan on recording extremely brutal metal vocals, this shouldn’t be a concern, but having microphones in your studio that are capable of being used for more than just recording vocals is definitely a great thing to consider. 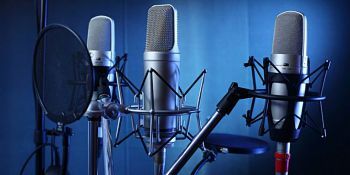 As we’ve had the chance to see, there are a lot of different models you can go for when it comes to vocal recording microphones. All of the mentioned models offer a slightly different and unique approach, depending on what you find to be the most important feature. I truly hope that you found this article helpful, and as always, thank you for reading!